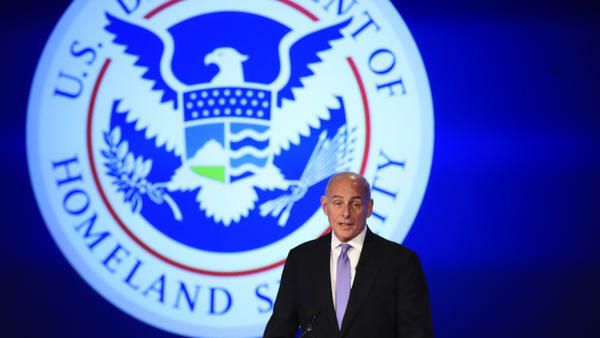 Homeland Security Secretary John Kelly, pictured in April, is extending the Temporary Protected Status designation for Haitians in the U.S. until January 2018. But he says conditions are improving in Haiti, seven years after an earthquake killed more than 200,000 people there. Homeland Security Secretary John Kelly has extended for six months a program that has allowed tens of thousands of Haitians to remain in the U.S. following the 2010 earthquake in Haiti. But Trump administration officials say they believe conditions are improving on the Caribbean island and that Haitians should make plans to return to their home country. Some 58,000 Haitians are in the U.S. under a program known as Temporary Protected Status. The designation was extended to Haitians in the U.S. after the earthquake, which killed more than 200,000 people, and was set to expire in July. Kelly is extending the TPS designation until January 2018, but he says conditions are improving in Haiti. Seven years after the earthquake, he says, the economy is growing and only a small number of Haitians are still in camps for displaced persons. And Kelly cites are other signs of improvement: The government has announced plans to rebuild the presidential palace, and conditions have stabilized enough that U.N. forces are preparing to leave the country. But Rep. Frederica Wilson, D-Fla., says Haiti is still struggling. "The reality is that in six months Haiti will still be in no position to absorb and aid 58,000 unemployed people," she said in a statement. "It will still be recovering from the 2010 earthquake and the subsequent cholera epidemic imported by U.N. peacekeepers that has killed 10,000. And it will still be struggling to rebuild the extensive damage its infrastructure incurred after Hurricane Matthew struck the island-nation last October. "During this six-month reprieve, I invite DHS officials to join me on a trip to Haiti." Kelly is expected to decide before January whether to renew the program once again or end it. A report prepared by the acting director of U.S. Citizenship and Immigration Services, James McCament, in April recommended the secretary terminate the program, but delay the effective date until January to allow "a period of orderly transition." In a statement Monday, Kelly said, "I believe there are indications that Haiti — if its recovery from the 2010 earthquake continues at pace — may not warrant further TPS extension past January 2018. TPS as enacted in law is inherently temporary in nature, and beneficiaries should plan accordingly that this status may finally end after the extension announced today." Some Haitians living in the U.S. have been granted a reprieve. The Trump administration has extended a program that has allowed tens of thousands of Haitians to stay in the U.S. since the 2010 earthquake in Haiti. But the extension is only for six months. And officials say this may be the last time they do extend this program because, even though life in Haiti is still hard, things are getting better. From Miami, here's NPR's Greg Allen. GREG ALLEN, BYLINE: Some 58,000 Haitians are in the U.S. with temporary protected status. The designation was extended to Haitians in the U.S. at the time of the 2010 earthquake. Because of the disaster, which devastated the island and killed more than 150,000 people, the Obama administration determined Haiti could not safely handle the return of its nationals from the U.S.
Now more than seven years after the earthquake, Homeland Security Secretary John Kelly is sending a strong signal that Haitians in the U.S. with temporary protected status should begin making plans to go home. He ordered a six-month extension of the program until January. After this extension expires, he said, quote, "this status may finally end." Kelly said since the earthquake, Haiti has made progress across several fronts. The Haitian economy continues to recover and grow, he said. And nearly all of those in camps for displaced persons have found more permanent housing. He also cited as signs of progress, the government's plans to begin rebuilding the presidential palace and the U.N. announcement that it will withdraw its troops from Haiti. But that's an assessment many others dispute. RANDOLPH MCGRORTY: Haiti is still suffering the effects of the largest calamity in modern history. ALLEN: Randolph McGrorty is with Catholic charities in Miami, which provides immigration services to many Haitians. McGrorty and other Haitian advocates welcome the extension but say the beleaguered island is not ready to accommodate an influx of 50,000 people. Although the rubble has been cleared from the earthquake, there's still a major housing shortage. The country is recovering from Hurricane Matthew. And a cholera outbreak is still not under control. With possibly just six months until they're forced to return home, McGrorty said Haitians with temporary protected status need to look at their options. They can see if there are other legal ways for them to remain here. But for many, he said, there will be hard choices ahead. MCGRORTY: Some of them have U.S. citizen children. So they're going to have to execute documents for custody planning, the disposal of property. This is a very lengthy and painful course of action that people are going to have to embark on should it not be extended beyond the six months. ALLEN: Immigration officials said Secretary Kelly would be taking a hard look at all temporary protected status designations as they come up for renewal. That may send a chilling message to tens of thousands of Hondurans, Salvadorans and Nicaraguans. The TPS designations for those groups come up for renewal over the next several months. Greg Allen, NPR News, Miami. Transcript provided by NPR, Copyright NPR.